Delaney Diamond, welcome to Romance Lives Forever. 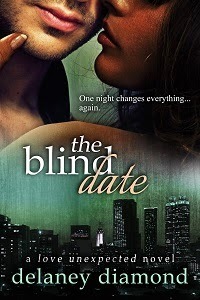 Let's talk about your book, The Blind Date. Tagline: One night changes everything...again. Most weekends I take a break from Facebook and Twitter, but I visit them the most during the week. I also like to visit blogs that provide industry news, but not necessarily every day. I visit those blogs a few times per week and catch up all at once. You're going to discover that you love writing fiction, so start practicing now. Whenever I feel overwhelmed by the marketing, writing, staying up to date on what's going on in the industry, etc., I get offline. That's usually a good indication that I'm spending too much time alone, so I spend time with family and friends. I love technology, but it drives me crazy sometimes. There's so much information available through social media, blogs, etc., and it's easy to feel as if you don't want to miss anything. But I find it helps me to unplug from time to time so I don't get overwhelmed. I plead the fifth. Lol. No really, not very much. Things my niece does have ended up in my books because she's so comical. In my book Second Chances, I had one of the children, Lucélia, running around with a yucca fry offering bites to family members but then pulling it back when they tried to get a piece. My niece used to do that with French fries. I thought it was cute, so I included it. I worked in international trade for a spell. When I worked in international trade, my area was Western Europe, so I got some nice all expenses paid trips abroad. The job only lasted a few years, but it was nice. When I have to pay for my own trips, I really miss it. Sigh. I also managed a bookstore. I read romance, mostly contemporary and historical. I also love to read thrillers because of the fast, heart-pounding pace that keeps me on the edge of my seat. I read Private Arrangements by Sherry Thomas a few months ago, and I couldn't stop thinking about it. It's a historical romance and it renewed my interest in Regency romance. Here's a quote from my review on GoodReads: "I couldn't put the book down, even though it hurt me to see these two characters inflicting such pain on each other. And that's actually why I couldn't put it down, because I needed to see them get their HEA after making my heart hurt so much." Sanaa Lathan or Gabrielle Union. I love those ladies! Yellow. It's my favorite color. Thanks for the interview and sharing the news about my book! Delaney was the first person to ever comment on my blog when I started blogging. She's an awesome writer and I can't wait to check out her new release. Congratulations. Thanks for being here, Nana! Thank you for that lovely comment, Nana!